What’s the best way of folding my leaflet? So you’ve asked us to create a new leaflet for you and you want it folded for maximum impact. Luckily, there are a few different ways of folding a leaflet and if you get it right, you can really get your message across. Your content will be the principal guide, but it’s useful to know a few of the more familiar fold types. They generally fall into the following types: simple; short; accordion (sometimes known as ‘Z’ folds), roll (or barrel), gate, French and parallel. Pop ups and other more creative folds allow for a bit more fun. You can see some of them below. Each fold has different uses and the fold we choose depends on the purpose of the publication. 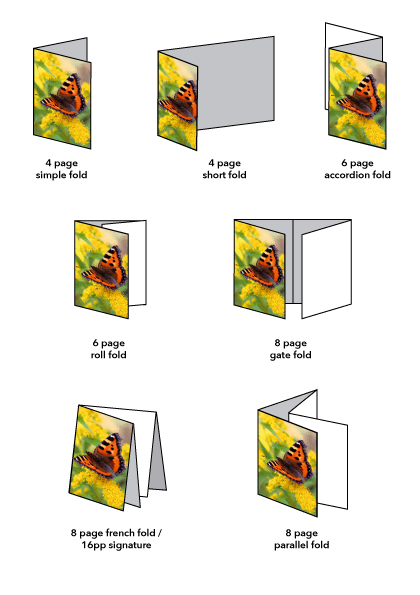 For example, we would advise using a roll fold if you want to reveal information in a linear, storytelling-type way, or a gate fold if you have information that would benefit from a large, cinema-screen type presentation in the centre. Before starting any project of this type, we would need to see the content first, to assess what would be the best type of fold to use. The placement of the content can then be planned accordingly before the design is created. As with most things, the more complex the materials, the more they are likely to cost, but careful planning can sometimes bring these costs back into the realms of possibility, so it’s always worth chatting it through. Spec work, also known as free pitching, is where, to create ‘goodwill’ and for no upfront remuneration, designers produce ideas and mock up projects to show a client, or potential clients what their logo, brochure etc might look like if they went with that designer. We don’t do spec work. You may wonder why? Well, we’re a business based on our ideas. As an example, some years ago when we were just starting out in West London, and against our better judgement, we came up with some ideas on spec for a potential new wine merchant client who seemed very keen to engage our services. We duly produced the designs according to his wishes, at which point, he stopped returning our calls and emails. Imagine our (lack of) surprise, when several months later, we were leafleted by that very same company—and their logo was exactly the same as the one we had designed. It had the same typeface, colours and even logomark. Exactly the same. Basically, this chap had taken our designs (the ideas are our business—they are our intellectual property and the basis on which we trade) and asked another designer to artwork them (the easy bit). Now, some of you will be thinking ‘but that’s intellectual property theft, you should be able to sue’. Well, in theory, yes we can. If we can spare the time and legal fees, that is. So we, like so many, let it drop. He won. He got his designs for free – although by not listening to our advice, he also wasted lots of money by leafleting a predominantly non-alcohol drinking area. Our answer to that is that we kind of expect you to have done your due diligence in choosing a designer. You wouldn’t choose a builder by randomly picking a name out of a telephone directory, and choosing a designer should have at least as much care and attention paid to it. Look at the work on our website, talk to people who know us and our work, and give us a call and chat to us. If you decide to proceed in using us, then you can be confident that we will do our utmost to provide you with the best solution to your particular design problem. We’re not selling high print run postcards that you can choose on impulse; we’re presenting your business brand. You have to pay an architect to draw up plans for you and that is a cost people accept up front. It’s no different with a designer. When you employ a designer, you’re not only paying for their time in working on your project, you’re also paying for their expertise and years of experience. It’s only partly about what we actually do or the time it takes, it’s much more about what we know. After all, that’s what allows us to ‘just design’ a solution that works for our clients in a much shorter time than they could manage themselves. Besides, if you’ve seen a variety of our work and like it, or someone has recommended us, why wouldn’t we equally be able to produce something that you love for you? By negotiating a contract (clients are entitled to query contracts/ask for amendments if they so wish), signing it off and agreeing to pay us for our ideas, you’re valuing what we do and entering into a viable and hopefully long-term working relationship with us. The people who work with us most happily are the ones who appreciate the value of ideas. With a good brief and clear communication, everyone should be able to reach a happy conclusion in sensible timescales. Of course, some people don’t like to engage a designer this way, but that is their choice. And ours. There’s a very good talk to a group of designers by Mike Monteiro that you can watch here if you don’t mind some strong language and a bit of talk about legal stuff.